I think as a team, we're obviously completely focused on simulating the sport that we love, but we do it in 3 key ways. Firstly we're always refining the features that we've built - polish I'd call it, ensuring that what's been built is as brilliant as it can be. Secondly is responding to feedback from our fans, they're a vocal bunch - as we like - and we'd be foolish to not listen to what they say. Removing frustrations or adding requests is something we spend a lot of time on. But the last part is the most fun, innovating - coming up with cool stuff that people aren't expecting. I think our team is synonymous with these 3 pillars now. We're really proud of it. The current buzzword in the industry at the moment is certainly "connectivity". 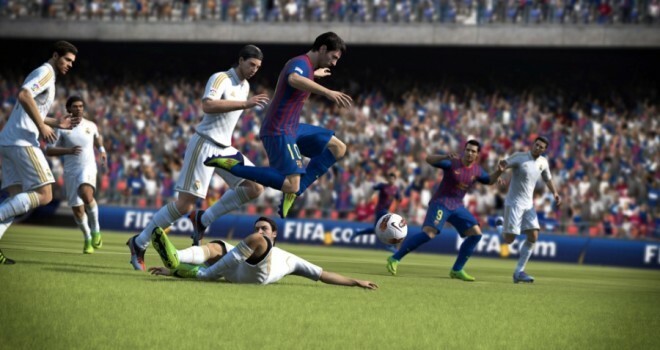 With the PS4's extended social capabilities and other sports simulators like Madden incorporating features like Connected Careers, is FIFA on a path to become more and more 'connected'? I'd argue we're already there. For someone with a connected console you're completely connected with the EA SPORTS Football Club component of the game now. Everything you do in the game counts towards your level, you can see what your mates have been up to. We're delivering data updates on professional players and injecting challenges from real matches. You can download an App to keep track of your EASFC stuff, and manage your Ultimate Team too from the bus or workplace. You're right - it'll get even more like this in the next few years. The answer slightly worried me. I actually thought Connected Career was a complicated step backwards step for the Madden franchise. Connectivity is great, but doesn't always work and can become problematic when the core of your game depends on it. One of the strengths of sports games are the open narratives that they tell. Narrative is a strange word to throw around games like FIFA but they are really what create powerful experiences. Even though it may not be instantly obvious, I would argue Football Manager's biggest strength at keeping players playing is that it is a powerful narrative creator. So far, connectivity in sports games has complicated that relationship for me. Rutter calmed my worries by saying, "Narrative has played a big part over the last year or two in career mode. It's something we're keen to push forward as well." Seriously, there are a ton of people who still enjoy single player experiences. Career mode in particular remains a massive mode in FIFA and remains a big focus for us. I think this is because its an excellent experience, and also because its sometimes a major hassle hooking up with your mates online to play head to head or the people online are quitting/cheating/beating you up. We're working on that too! But does FIFA ever want to expand it's current trappings? FIFA is already a massive experience and portal for players. But do they want to grow the experience with bigger rosters and more players? Is it better to have a broader experience with more playable options or is a narrower, more detailed approach best for the series? "Wow. That's a tough one." David admits. I think many things poorly delivered are weaker than few things delivered well. But - and it's a balance - measures of new, improved and broadened are pretty much what I mentioned before. For FIFA were already really pretty broad - single player, co-op, competitive multiplayer, ranked, unranked, career, and all locked to a player or as any player, across a massive comprehensive set of players, teams and leagues. It's a huge game. Our biggest features in the last 3 years have probably come from 'deep'. I think deep is what gets the 90+ ratings and the fans eager, but you can't be too narrow. Our fans have really diverse tastes in modes and we need to cater to that. Unless this is the first of my work you have ever read, you probably know that I am a huge advocate of video games as art. They are interactive expressions that bring a diverse and incredible range of ideas to the table. "I doubt many people looks at FIFA and think: 'its a work of art'...but I think in many ways it is" David says hopefully. I totally agree. It is the coming together of many ideas and creative decisions to create a 'realistic' experience. The word simulator implies it is all about mimicry, but I think that is cutting the game short. I think for us, we're in a really hard spot. Sports games - from a videogame standpoint - are a lot harder to develop than you'd think. We're trying to simulate something that's totally familiar to everyone - human likeness and movement. We're also trying to have these many characters display intelligence specific to them and that work in the context of a competitive sports match, which most people are also very familiar with. Then we need to wrap it all up in an authentic skin - kits, boots, balls, stadia etc. And on top of all that, its pointless if it doesn't play amazingly. Many things have been said, and not all of them nice, about FIFA getting nominated for awards like best game. Perhaps this comes back to my other point that people don't see FIFA as a work of art. But BAFTA are no chumps when it comes to video games. They don't always award the biggest or even necessarily the best reviewed games. In fact in the last few years, indie games have been toppling massive AAA games. You only have to look at Journey and The Walking Dead as proof of that. Even Unfinished Swan ended up sweeping some awards on Tuesday night. My point is, BAFTA don't vote on what sells the most for the easy option. Hell, (maybe I shouldn't bring it up but...) even New Star Soccer beat the FIFA at the awards in the Best Sports/Fitness Game category. Ruttter explains what it means for the FIFA team to be nominated for an award. I think its lovely that the videogame world is getting credible recognition from mainstream organizations. Alongside that, I do know that it means a lot to the development team because its one of the best ways to gauge whether or not our peers think we've done a good job. Oh, how right it is.